It’s easy to move forward knowing your interests come first. You can be more confident knowing our goals-based approach is disciplined, tested and guided by your unique objectives. We start by identifying your near-term requirements and long-term goals. Then we use those insights to develop tailored investment strategies and construct robust, efficient portfolios – all carefully designed specifically for you. Once your plan has been implemented, you will receive clear, concise, actionable information on its performance. Timely information, along with our dynamic approach to managing investments, facilitates course corrections and dramatically boosts the odds of achieving your goals. 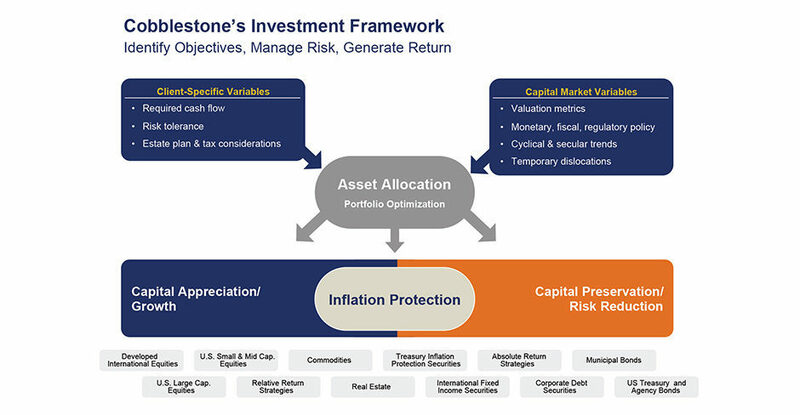 © 2016 Cobblestone Capital Advisors, LLC. All Rights Reserved.